As we heard in April, Kevin Rose and former Digg designer Daniel Burka have teamed up to start Milk, a mobile app development lab in San Francisco. The company also raised $1.5 million from a number of all-star investors, including our own Michael Arrington. Now, we’ve just found a little more information on the first app that will be debuting from the incubator, Oink. 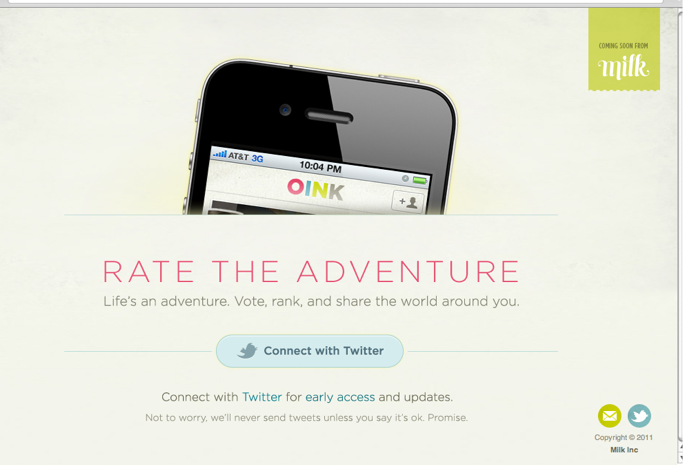 It appears from the site that Oink will be an iPhone app that lets you ‘rate the adventure’. From the tagline on the front page, ‘Life’s an adventure. Vote, rank, and share the world around you.’ The app is connected to Twitter, but not Facebook (yet). things not places. While location-based check-in apps like Foursquare are great for broadcasting your location, they don’t get inside the places to expose the best things there. In contrast, Yelp has a great web experience, but the length of the reviews aren’t conducive to mobile and the service is more information-focused. Rose says Milk aims to build a more lightweight, interactive app where it takes a few seconds to go in and rate and rank things around you. Oink will launch as an iOS app, will feature integrations with both Twitter and Facebook, will give users the ability to share photos, and will take advantage of location. “We’re going to allow users to share what they are currently enjoying. We’re going after a more granular experience,” Rose explains. As my colleague Sarah Lacy reported in April, Milk isn’t your typical incubator. The startup aims to ‘solve a handful of big old-industry problems using the mobile Internet’ and only expects to launch a few big ideas and projects in the next year. And they will be radical, and so forward-thinking that some may fail. We’ll see exactly how Oink fits into Milk’s broader strategy in a few months as the app is set to launch in late summer or early fall.